This is a Castillian Reconquista order, whose cross (bleu, a cross fleury gueules, outlined in gold and hollow of the field) can be found on some Portuguese family coats of arms. The Order of the Holy Sepulchre of Jerusalem is an organization with non-religious (men and women) and religious members; it has currently 21,000 knights all over the world, grouped in 54 Lieutenancies of Magistral Branches. The Order is recognized by 25 countries, including Belgium. The statutes of the Order were approved by Pope Paul VI on 8 July 1977. The Order is placed under the protection of the Holy See. Apostolic Letters by Pius XII (14 September 1949) and John XXIII (8 December 1962) recognize to the Order a legal status by canonical right; Apostolic Letters by John-Paul II (1 February 1996) recognize its legal status in the State of Vatican. The goals of the Order are to increase among its members the practice of Christian life, to support and help the Roman Catholic Church in the Holy Land, especially in the Latin Patriarchate of Jerusalem, to encourage the preservation and spread of the [Christian] Faith in the Holy Land, and to defend the rights of the Catholic Church in the Holy Land. The Order is directed by a Grand Master, who is a Cardinal appointed by the Pope. The Latin Patriarch of Jerusalem has the title of Grand Prior of the Order. Lieutenants are appointed by the Grand Master to run the Lieutenancies. 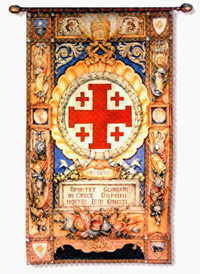 "The emblem (not necessarily a flag) and the motto of the Order are those of Godefroid de Bouillon and his successors in Jerusalem: the cross potent gules, cantoned with four crosslets not potent of the same, which symbolize Christs' five wounds, and the motto "Deus lo vult", granted to the Crusaders by Pope Urban II when he called for the Crusade on 27 November 1095." The emblem shown on this site is a square with the red cross and crosslets and the motto DEUS LO VULT, in red too. On its website is the complete name of the order: "The Equestrian Order of the Holy Sepulchre of Jerusalem". At a webpage of the Magisterial Delegation of EOHSJ for Canada-Atlantic there is an illustration of the order's banner and one of its gonfalon or ensign [sic]. The Ensign of the Order consists of the Gonfalon of white silk with a red staff surmounted by Military Trophy. The cloth (1.80 x 2.10 m) is knotted to the staff set spirally. A fringe border of 0.40 m hangs from the horizontal lower pole, its colors and fringes symbolizing the Lieutenancies of the Order. On the face of the Gonfalon stands the Crusader Flag. On the top of the empty Sepulchre the ornamental scroll with festoon and the motto in Gothic characters, ‘Deus lo vult’ is extended. The figure of the resurrected Christ is enclosed at the side by an ornamental motif alternated with Crosses of Godfrey of Bouillon and Crowns of Thorns. From the knobs of the upper transverse pole hang the ribbons of the Order in watered black silk. The Cross of Godfrey of Bouillon stands out on the side of the Gonfalon [I don't see that in the image]. The Gonfalon is kept in the seat of the Order in Rome. Its use is regulated by the Cardinal Grand Master. This banner is also hung vertically from a crossbar as the gonfalon/ensign is. It has a blue field with a gold border all around. The border is divided into compartments with religious imagery and arms within. On the blue field is the Sepulcher, surmounted by a large medallion bearing the Cross of Godfrey of Bouillon, and above the medallion a papal tiara extends into the upper compartment of the border. In the upper corners of the blue field are two images - I can't be sure but think they are angels [source: same webpage]. The Ensign of the Lieutenancies of the Order is a standard of white silk, with a red staff, surmounted by the Military Trophy. 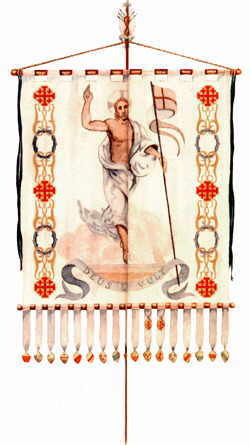 The wide panel (0.80 x 2.40 m), which ends in a point, bears on its face the figure of Christ Rising from the Sepulchre, and He is bearing the Crusader Flag. At the base is the ornamental scroll with the motto: "Deus lo vult,' which can also be translated into the language of the respective nations. From the knobs of the transverse pole hang the ribbons: to the right that of the Order, in black watered silk, to the left the ribbon with the colors of the nation of the Lieutenancy. The Cross of Godfrey of Bouillon stand out on the side of the standard. The standard is kept in the seat of the Lieutenancy and the Lieutenant regulates its use. The Ensign of the Sections is a flag of white silk with a red staff, surmounted by the Military Trophy. On the face of the material (0.60 x 0.60 m), with a swallow-tail of 0.80 m, stands out the Cross of Godfrey of Bouillon. The arms or the colors of the Region stand out on the side. The flag is kept in the seat of the Section and the President regulates its use. I took this picture on May 28, 2008 in Rome. The picture was taken on the Via della Conciliazione, and it is seen on one of the roofs of the Hotel Columbus (http://www.hotelcolumbus.net). In this picture (http://www.hotelcolumbus.net/visita/prospettoG.jpg) one can see the façade, and the flag I saw was on the top left. The particular thing is also the finial of this flag, a Jerusalem cross. In fact, the Hotel is located in the Palazzo della Rovere. Using Google Earth's application "Street View", one can have a good look at the building in which the flag is seen on top. The flag is there because "In the period 1943-1945 the Equestrian Order of the Holy Sepulchre purchased the Palazzo from the Penitentiaries, the Municipality of Rome, and two private citizens". As your photo shows, and http://en.wikipedia.org/wiki/File:Flag_of_the_Order_of_the_Holy_Sepulchre_over_the_Palazzo_della_Rovere.jpg confirms, the flag does not have the motto written on it, unlike the emblem. It is very similar to the flag of the Franciscan Custody of the Holy Land lacking only the fimbriation, and to the 1333-1921 Jerusalem Civil Ensign which has a Latin cross in the center. In modern French, someone riding a horse is called a "cavalier". The word was derived at the end of the XVth century from Italian "cavallere", from "cavallo", a horse. "Cheval", a horse, comes from the Lower Latin word "caballus", derived from the Gallic word for a bad horse, and superseded the Classic Latin word "equus". "Chevalier", a knight (and not anybody riding a horse - at that time, however, only knights could ride a horse), appeared in 1080 as "chevaler" and around 1130 in its modern form, from Latin "caballarius". In the Ancient Rome, the knights were the members of the equestrian order, intermediate between the plebeians and the patricians. "Ordre équestre" is used today in French to designate certain chivalric orders. The meanings of "cavalier" and "chevalier" are strictly different in modern French, even if the two words have a common origin. The Four Horsemen of the Apocalypse are "les Quatre Cavaliers de l'Apocalypse", whereas the Knights of the Round Table are "les Chevaliers de la Table Ronde". King François I was nicknamed "le Roi-Chevalier" (the King-Knight) after Knight Bayard ("le Chevalier sans peur et sans reproche" - the Knight above fear and reproach) had dubbed him on the battlefield of Marignan in 1515. Accordingly, there are "cavalières" (horsewomen), but a "chevalière" is only a signet ring. Even Joan of Arc was never granted such a title. The Dominican cross uses a very peculiar style of cross flory (or fleury) usually known in heraldry as an Iberian cross, because it was used by the four main Iberian orders of chivalry: Alcántara, Calatrava, Montesa and (except for the bottom arm of the cross) Santiago. We have an image of the Calatrava cross above. The Iberian cross has however more elaborate arms, their curved and buttoned ends touching back on the straight part near the cross' centre. An image is worth a thousand words so: http://www.chivalricorders.org/orders/spanish/calatrav.htm. Further information on these four Order can be found at http://www.chivalricorders.org/orders/spanish/fourspan.htm. Black, as absorbing light, represents interiorization and appropriation of knowledge. White, as the lack of colour and the plenitude of light, represents truth revealed to mankind and enlightening it. A detailed account of the history of the Dominican Order can be found on the Catholic Encyclopaedia. The Equestrian, Secular and Chapter Order of Saint Joachim was established on the 20th of June, 1755 by fourteen nobles and distinguished military leaders of the Holy Roman Empire. Having seen the terrible consequences of ongoing religious wars in Europe, our founders dedicated themselves to "worship the Supreme Being, show tolerance towards all religions, loyalty towards their princes, support the needs of their military, the poor, widows and orphans." The Order was uniquely composed of both Protestant and Catholic nobles and leaders at a time when religion violently divided Europe and the German states within the Holy Roman Empire, and other knightly orders allied themselves exclusively with one faith or the other. The Order was headed by His Serene Highness Prince Christian Franz von Sachsen-Coburg Saalfeld, son of reigning Duke Franz Josias. Prince Christian Franz was installed as our first Grand Master on June 20th, 1756, a position he held until 1773." About the flag: The design features the arms of the Order over an eight-pointed white cross on a green field surrounded by a gold embattlement. The flag of the Order is here http://www.stjoachimorder.org/orderinsignia.htm.